Warty corallimorphs, also called warty corallimorphs, and St Thomas Mushrooms, Discosoma sanctithomae, are an interesting corallimorph that seem to be a cross between a ricordea and a discosoma mushroom. They come is a variety of shades of green and have differing colors and types of tentacles. Were going to sell them as two different color morphs, the lime green and the olive green, but they are all basically the same genus and species. The lime green ones seem to be a little less common so we are asking a little bit more for them. They will inflate to about 2 and possibly more, and both color morphs get along together. All of the corallimorphs we sell are extremely hardy and are great for any level of reef keeper, from the novice to the pros. They are primarily photosynthetic, but should be fed some sort of supplemental planktonic foods. In the wild they eat the organic dust and silt that settles on them, so when feeding them, dust them with food. These are loose polyps and are not attached to any significant amount of substrate. They will eventually attach to any clean substrate in your tank, or you can epoxy or superglue them to what ever you want. 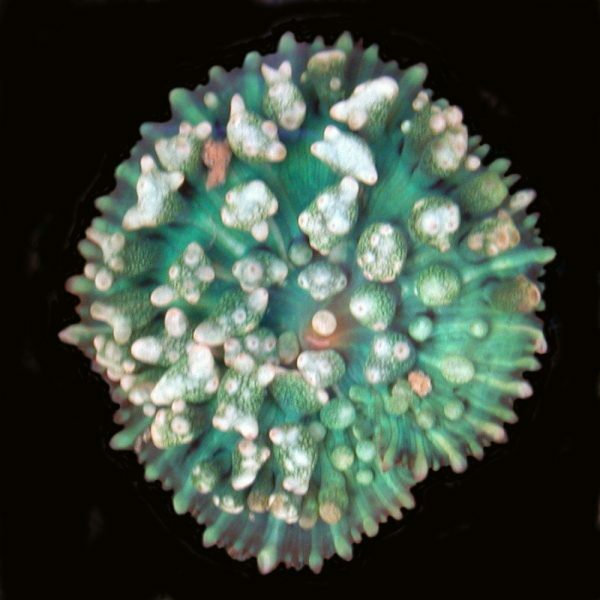 As with all corallimorphs, anemones, zoanthids, and corals, be careful handling them in and out of the water. They produce stinging cells that can sting your hands and irritate your eyes, so use gloves if youre sensitive to their sting, and don’t let the mucus get in your eyes. Awesome mushroom! I was very pleased with the mushroom I received . It is about 3″ across when fully inflated and has a really cool look with the big bubbles. Highly recommend you get one! Ordered one, Phillip sent two! Love them both. I’ve had them for a couple of months now but they adjusted to my system and began inflating within 24 hours. Very interesting coral. One is more blueish than green and has knobby tentacles where as the other looks lime green in daylght, iridescent glowing green under the blues, with pointy, bubble shaped tentacles. Very nice purchase. These are amazing! Beautiful coloring! Different colors depending on angle for sure! Absolutely strange animal- it was everything i hoped for. Looks like a hybrid of a Actinodiscus green striped mushroom and bubble tipped anemone. I highly recommend this seller- great value and better service. I love these St. Thomas shrooms. Very cool looking and a nice addition. Thanks for the freebies. Lovely corallimorph. Blueish maroon when viewed from the side, iridescent lime green when viewed from above. It is not really warty looking. It has short bulbous tentacles, kind of between a ricordea and mushroom polyp in appearance. Nice Colors. Opened up quick and looks great. If you are thinking about them pick them up, you will be happy. very noce mushrooms, these are a high demand item at most LFS and are much more expensive. interesting look and nice color. This lime green corallimorph is so pretty! I thought it wouldn’t look as cool in real life, but it does! Really cool, the one I received looks more blue (under my T-5s) with green tips. Really nice, will be ordering at least one more in the near future.